BlueStream has been designed for capturing, encoding, storage, and streaming IP video for multiple remote sites viewing. BlueStream encompasses Video On Demand (VOD) that utilizes Video/Control-Over-IP, based on enhanced MPEG 4 Window Media Format Technology and Microsoft Media Player Version 9. VOD allows you to digitize & store all your videos into a centralized media server. User with PC connected to the server can watch the videos from anywhere without the need to hunt for a traditional Video/VHS player. When you want to view or search for a video in the Media Server, simply connect to the video server and click on the video you are interested in watching. The video will be streamed to your desktop via Windows Media Player or other compatible Desktop video player. With VOD facility, users are no longer limited by the availability of audio-visual equipment in the media viewing area or the opening hours of the viewing area. Access is no longer constrained by place and time. 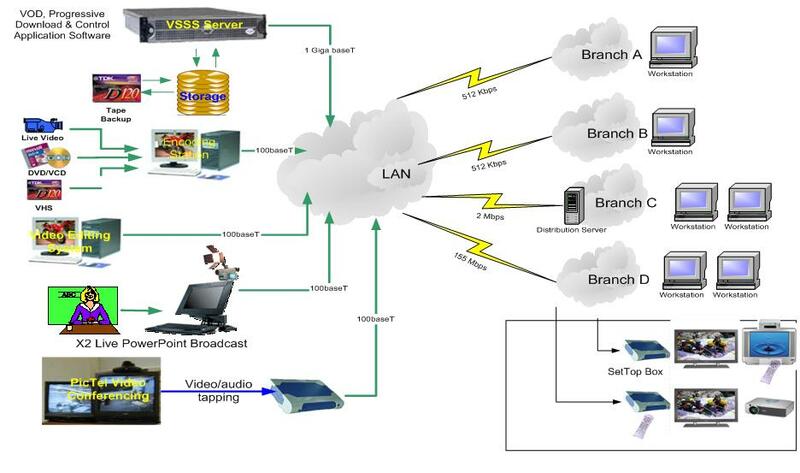 Users can watch a video at their desk, conference room, meeting room or any location with connection to the Video Server.